I recently attended two days of training about Breast Cancer. The number of cancer survivors is growing. By 2030, England will have over 3 million people living with or beyond cancer. Post-surgery, physiotherapy can help recover maximum movement and function. Beyond any subsequent treatment, exercise can: help improve physical and psychological well-being; improve, function; manage the consequences of treatment; and reduce the risk of other diseases. To resume exercise, start little and often with regard to feeling unwell any discomfort or symptoms that may worry you. The Macmillan website has a Move More Guide. Physically, Pilates can help build your muscle mass, improve your strength and endurance, increase your range of movement and energy levels. If you have had breast cancer, I will ask you to complete a supplementary enrolment form, so I can better understand your treatment and any special considerations that might apply for the exercises that you should do. Improvements in public health, education and medicine mean that we are living much longer. By 2035, people aged over 65 living in the UK are expected to exceed 17 million. That will be almost one in four people. As we age, can we still maintain good health and keep our independence? This is the aim of the Government’s ‘Ageing Society’ Grand Challenge. One approach to achieving this goal is to encourage us to adopt healthier lifestyles – better diet, more exercise, keeping active in old age – to reduce our risk of disease. A second approach is to identify those who are at most risk of disease or have undiagnosed conditions and to intervene. Thanks to studies of volunteers from the eastern region, we may be able to spend our extra years living independently and in good health. Read more in this report from Cambridge University. Lewis Hamilton already has five world driver titles, but he is still working to improve. In January, he revealed his new fitness regime, using Pilates and yoga to increase his core strength, on Instagram. Read the full article in the Daily Mail. The hamstrings are tendons (strong bands of tissue) at the back of the thighs that attach the large thigh muscle to the bone. The term “hamstring” also refers to the group of three muscles that run along the back of your thigh, from your hip to just below your knee. The hamstring muscles aren’t used much while standing or walking, but they’re very active during activities that involve bending the knee, such as running, jumping and climbing. A hamstring injury is a strain or tear to the tendons or large muscles at the back of the thigh. It’s a common injury in athletes. The recovery time depends on how severe the injury is. A strain may take a few days to heal, whereas it could take weeks or months to recover from a muscle tear. Causes may be weak or tight hamstrings; muscle imbalance between hamstrings and quads; weak glutes; not warming up properly or increasing the intensity of your run too soon. Regularly stretching and strengthening; warming up before exercise and stretching afterwards, may help reduce the risk of injuring your hamstrings. In Pilates, we work to achieve an optimum balance of flexibility and strength within muscle groups and between agonist and antagonist (opposing) muscles such as quads (which straighten your legs) and hamstrings (which bend your legs). However, note that different sports have different needs. If you are a dancer, you will need long hamstrings, but if you are a runner, long hamstrings may cause you to overwork your glutes. So, although it might be a great ‘party rick’ it is not always appropriate for all of us to have an ambition to get our hands flat to the floor with our legs straight. Thank you for completing the brief survey included with your annual renewal forms. I’ve collated your responses in this post. I’ve paraphrased your answers to keep them anonymous. Ice – Apply an ice pack (such as a bag of frozen peas in a tea towel) to the injury for up to 20 minutes every 2 to 3 hours. While treating with RICE, avoid heat, alcohol and massages. Painkillers like paracetamol will ease the pain and ibuprofen will bring down swelling – but avoid the later for 48 hours after your injury as it may slow down healing. As soon as it is not too painful, start moving the injured area so that the joint or muscle doesn’t become stiff. Too much rest can cause your muscles too shrink and scar tissue to form. However, be cautious, because doing too much strenuous exercise too soon could make your injury worse. After two weeks, most sprains and strains will feel better. Continue to avoid strenuous exercise, such as running for up to 8 weeks, to avoid the risk of further damage. Severe sprains and strains can take months to get back to normal. Seek medical help if the injury is not getting any better or is getting worse. See the NHS website for more information. Here’s a quote from Joseph Pilates about the need to concentrate in order to perform the exercises correctly so as to benefit from them. Here’s a video of me doing some advanced Pilates using the large studio equipment. This exercise is Climb a Tree on the ladder barrel. "You have given me back a pain free life." 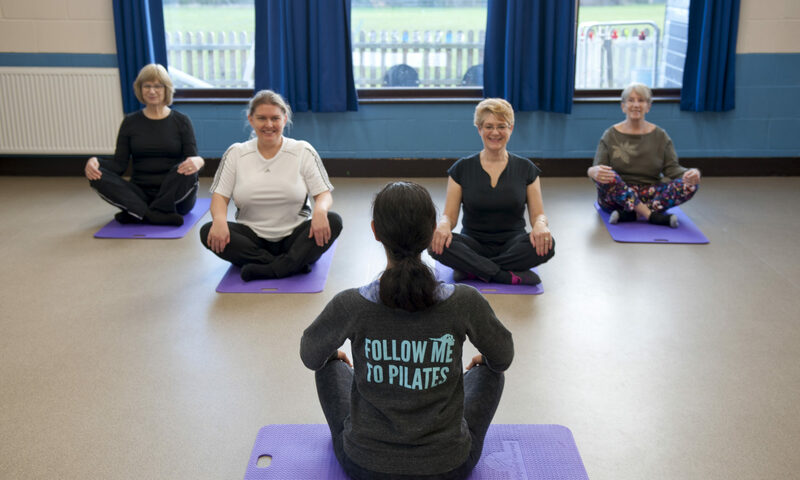 Sign up for occasional Pilates news and class dates.